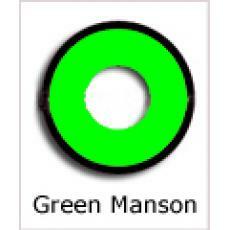 Green Manson Contact Lenses Perfect for many costume choices, such as The Incredible Hulk! Want to look as mean as the Incredible Hulk or simply want to look absolutely wild? The Green Manson contact lenses by Coco Contacts are the perfect lens pair for you. Great for costumes from the Incredible Hulk to peas in Plants VS Zombies. Let your imagination soar with the Green Manson lenses.